Pillow + Blanky = Pilanky! Happy Jo Designs create Comfortable, Practical and Washable accessories for babies and toddlers aged 1-6. There's the PILANKY ®, an all-in-one Kids Daycare and Travel Bed, the practical Nappy Change Bag and other accessories! Quality fabrics and materials produced at a high standard. Our promise is to give the best to you and your kids. Quality made double layered mattress with even thicker pillow attached. Double width detachable sheet and blanket for extra comfort. Many colourful patterned fabrics to choose from for Girls or Boys or Unisex fabrics. Custom made in Australia with personalised child’s name. Durable quality and design to withstand easy washing and maintenance for years. Sheet and Blanket can be washed separately to mattress and pillow if needed. Recommended as an affordable and convenient alternative to the old “blanket and sheets” required for families to bring to daycare. Comfortable and easy to roll up and store away. Comfortable and colourful fabrics with embroidered child’s name to make kids happy. Easy to carry, Easy to wash and Easy to roll up. Comfortable and light weight product for your child to carry all year around to preschool. Great relief to not bringing separate stuff every time. 100% washable with new detatchable sheet. Great for sleepovers. An emotional bond with their Pilanky that every kid loves to carry when visiting their friend’s or Grandparents house. Grab and go – Simplifies the travelling hassles for everyone and kids. An ultimate travel companion. Comfortable and Washable. Camping calls for comfort bedding and comfort calls for Happy Jo Design’s Pilanky. Easy to pack, Easy to carry, and even Easier to wash. Happy Jo Designs was founded in 2008 when Jo had her first child and made a very practical Nappy Change Bag. She wanted to help other new parents with practical, washable accessories sothe Nappy Change Bag was launched at the Bellingen Market, NSW, Australia in early 2009. Jo soon discovered that there was a need in the market for a Toddler Bed for Day Care so she invented the PILANKY®.This Personalised product was loved by many parents and Day Care educators across the North Coast region of Australia. These two products were so popular at the markets that Jo focused on Online Sales and moved to a bigger market area in the Tweed Coast. The Gold Coast markets have been extremely successful over the past 6 years as they attract thousands of visitors from all over the world. 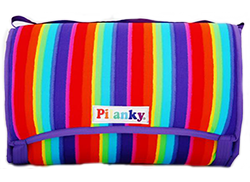 The PILANKY®(derived by pillow/blanky) – is an all-in-one portable bed for toddlers aged 1-6 years! It is the best alternative to kindly sheets for childcare. You will use this every time you’re outside the home until your child is out of nappies! 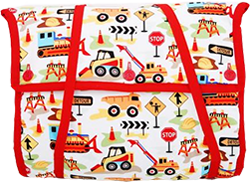 This Nappy Change Bag from Happy Jo Designs is Colourful, Practical & Washable. I received a PILANKY® from Happy Jo Designs as a gift from my mum, and couldn’t believe my eyes. My little boy loves his PILANKY® with little cars design. He was so excited that he slept in it, on his bed for three nights when we received it. It has been excellent for daycare and my daycare centre thinks it’s is perfect because it has his name embroidered on the front. I am so grateful that I will no longer have to pay for lost sheets, pillows and blankets. No child that goes to daycare should be without the PILANKY®. Such a great idea! I have the PILANKY® for both of my sons and they are the envy of day care! Every child needs a PILANKY®! My 4 year old son picked out his patterned material and colours and Jo was amazing. He couldn’t decide at first and Jo was very patient and happy to assist my son. He was starting his first day at a new Preschool and was taking it with him. He absolutely loves it. He uses it at Preschool, home and on sleep overs. He is so attached to it and it’s so light and easy for him to carry, unfold, fold up and pack away. The PILANKY® is easy to travel with, wash and dry. It hasn’t faded, still looks brand new and hasn’t lost its shape. I tell everyone how fantastic the PILANKY® is and how wonderful and friendly Happy Jo Designs are. They would make a great gift. We were so excited to add a 3rd PILANKY® to our PILANKY® family! I first discovered the amazing PILANKY® while working in a Childcare Centre a few years ago. I knew that when I had children of my own I too would be buying Pilanky’s for them. As a Childcare Educator the Pilanky’s took a lot of stress out of the daily task of making the children’s beds for rest time. The PILANKY® helps give children the confidence they need to begin self-help tasks as they are easy for little hands to lay out and do up, and therefore build self-esteem. As a parent there is no worry about sheets and blankets going missing as they all fold up safely together and another bonus is they are machine washable! My kids use their Pilanky’s for sleep overs, camping, daycare and even for imaginary play. Keep up your amazing work Jo! I have owned and ran long day care in the Hunter region of NSW for some years now. At rest time the enrolled 28 children have their own individual PILANKY®. These items have definitely value added to my business! Using these fits with the Early Years Learning Framework and assists in meeting the National Quality Standards! For the staff they are so easy to manage. Each child knows their own bedding from the individual pattern, they roll up in a jiffy and have a handle to carry them to store in the cupboard and roll out speedily onto the rubber mats we have. The children like to help and do this for themselves over after watching the educators. Our PILANKY® comes with a mattress cover that buttons on. Each element can be washed, and periodically the whole unit can go in the washing machine so that the super comfy padding and snuggly top blanket gets a wash too. At the same time, their little teddy bear that they brought from home, to live at day care can be washed with the PILANKY®. Many of my Pilanky’s are a number of years old but still look as good as the day they were bought, due to the incredible sturdy material and professional sewing. Address: Banora Point, NSW, Australia.